I shot this photo out the car's window. My question to you is this: in what direction did I take the photo? Was I pointing my camera towards the front of the car or towards the back, and why do you say so? I'll post the answer and the reason for the question tomorrow. Posted in Landscape on Monday, 5 January, 2009 by Paul. 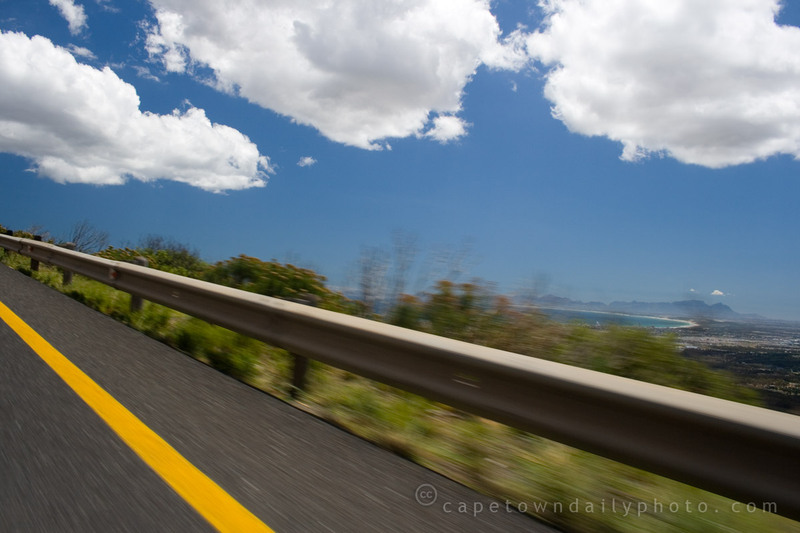 You must have been facing backwards (or driving really badly on the wrong side of the road, overtaking another vehicle by going over two lanes, while taking a photo out the driver side along Sir Lowry’s pass). My first thought is camera pointing backwards because you drive on the left in SA and some-one else maybe Kerry-Ann was driving….. I meant to say, “objects on the left side of the photo show less motion blur than the closer objects on the right of the photo”. Thank-you all for your comments. Please take a look at today’s post for my elaborate answer to the question. @Marius : Yup, indeed she was. You make a good point Anonymous. There’s a flaw however. From the angle of the photo the amount of zoom would have to have been substantial. The amount of zoom necessary would have created a huge depth of field causing far more blur than the motion blur you see in the photo. Um… surely it could be either? 1) Looking out the left hand window facing backward, driving in the lane close to the barrier.